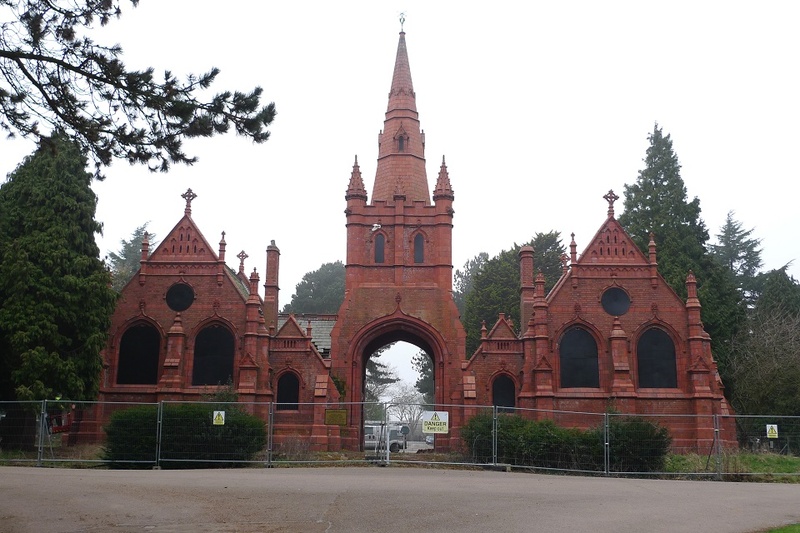 In 2008, Birmingham Conservation Trust worked with the Friends of Brandwood End Cemetery on an Options Appraisals to identify a future for the Mortuary Chapels which form the centre piece of the Victorian-designed cemetery at Brandwood End in south Birmingham. Unfortunately Birmingham City Council did not take forward any of the options and the chapels are still in need of restoration, despite efforts by the local Friends Association to re-initiate work on them. The Friends of Brandwood End Cemetery first met in July 2005 and since then have managed to raise money to help secure the buildings. This has allowed work to board up and fence the buildings, which was carried out at the end of 2006. The friends have restored other parts of the cemetery and improved the experience for visitors. They are an active group and you can find out about their work HERE. The twin chapels were designed by Mr J. Brewin Holmes, a Birmingham architect, and built in the Gothic style from red brick and terracotta. The eastern most mortuary chapel was for Non-conformists and its partner consecrated for Anglican services. Both mirror each other, containing a chancel, coffin chamber, vestry and an underground heating chamber. They are linked by a carriage entrance archway, which is surmounted by a tower and spire. The cemetery itself has a grade 2 listing and is on the Historic England (was English Heritage) Register of Parks and Gardens. The chapels are grade 2 listed. One has been badly damaged by fire, making both unsafe to use.